These help pages are common for both the free and Pro versions of the app. The free version displays ads in the settings and files section, but not on the main screen (used while driving). DailyRoads Voyager is an Android app, allowing for continuous video recording from vehicles. 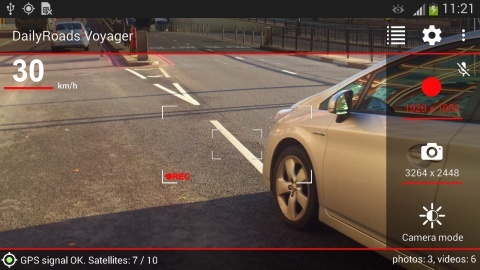 Essentially, the application acts as a video black box, dashcam or auto DVR, recording everything, but only keeping what the user is really interested in. The user is usually the driver of a car, who can now quickly and safely capture video sequences of important road events. Typically, on an average journey of a few hours, only a handful of video files (5-10 minutes) are worth keeping. Nevertheless, the application records and saves everything that happens in front of the camera, while running a cleanup process in the background, so the storage space doesn't fill up. Older and unimportant video files are constantly deleted, while important events (triggered by the accelerometer, or manually) are stored away for later viewing. Additionally, photos can also be automatically captured at specific intervals. Video and photo files are timestamped, geotagged, and even uploaded according to the user's pre-set options. Speed, elevation and GPS coordinates are saved each second, and can be shown on the videos. Reverse geocoding can be also performed automatically or manually on photos/videos. Then, the accumulated files can be easily managed, played back, and grouped in selections.